As of mojoPortal version 2.4.0.3, the Blog feature has built in support for generating a Google News Site Map, which can be used to submit content to google news for syndication. You should read the google publisher documentation to learn about the requirements and guidelines for submitting news articles to make sure the content that you are submitting meets the criteria specified by google. Only posts that you mark for inclusion in the news site map will be included so you can still also use your blog for non-news content. As per the guidelines, only articles published within the last 2 days will be included in the news site map. You can also upload an image that will be included in the news site map and may appear next to the link to your article if it is accepted by google. The url that you would submit to google is yoursiteroot/Blog/news-map.ashx. If you have multiple blogs in your site they will all use the same news site map but each blog has its own settings for default values of certain things such as the publication name. You must provide a publication name or your post will not be included in the news site map because this is a required element. You can also override certain settings at the post level. 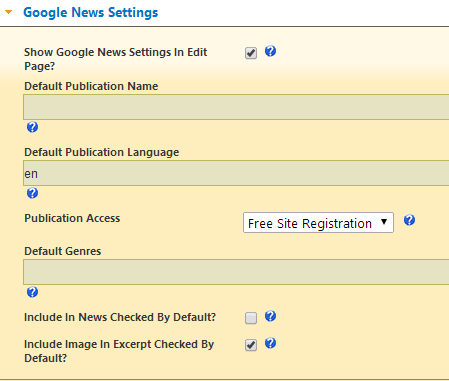 There is a new section of settings related to google news in the Blog settings as shown below. If your blog is not used for publishing news articles you can optionally hide those elements in the edit page of the blog.